You can login to your account by clicking on the link at the top-left of the HELM Catalog Page or by typing your Login and Password located below the Search Box. The Login credentials vary according to the college you attend. For details on your login information, click on your College's name under Need Help Logging In on the Catalog Homepage or click here. Once logged in you can change your password and personal information using the menu on the left-hand side of the page (see below). YOUR LISTS allows you to create both private and public lists. A private list can be seen by you only. Public lists can be shared with anyone who uses the catalog. Lists can help you to keep track of books you want to read or have already read. You can create a new list by choosing the Your Lists tab after selecting Your Lists from the menu on the left, click on New List and give your list a name. You can then sort this list in various ways, e.g. title or author. Your Lists creates a private list. If you want to create a public list, choose the Public List tab and follow the same method. Either of these allows you to decide who can make changes to the lists. The default is Owner Only. If you want to share the list, be sure to use the drop-down menu to do so. 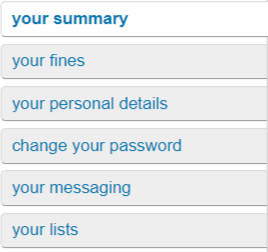 From YOUR SUMMARY you can view items that are checked out or overdue. The Holds tab enables you to see any holds you may have placed on items. Here, also, you can cancel any holds if you wish. To cancel a hold, just click the CANCEL button next to the item in question. You will be asked to confirm this action. in addition, you can see and renew both overdue and non-overdue items from this page. To renew an item, click RENEW next to the item. YOUR MESSAGING allows you to set your preferences for Library related transactions. You can choose to receive messages from the Library in various formats - by email, text, or in digest form. You can receive advance notice of when an item is due by choosing the number of days in advance you would like to receive this notice. Other options include notification when your hold has been fulfilled, if an item has been checked out, or if an item has been checked in. If you wish not to be notified at all, please check the appropriate boxes in the Do Not Notify column. If you wish to receive text messages, add your cell phone number at the bottom of the page and select your cell phone provider.